Contemporary critical studies have recently experienced a significant spatial turn. In what may eventually be seen as one of the most important intellectual and political developments in the late twentieth century, scholars have begun to interpret space and the embracing spatiality of human life with the same critical insight and emphasis that has traditionally been given to time and history on the one hand, and social relations and society on the other. Thirdspace is both an enquiry into the origins and impact of the spatial turn and an attempt to expand the scope and practical relevance of how we think about space and such related concepts as place, location, landscape, architecture, environment, home, city, region, territory, and geography. The book's central argument is that spatial thinking, or what has been called the geographical or spatial imagination, has tended to be bicameral, or confined to two approaches. Spatiality is either seen as concrete material forms to be mapped, analyzed, and explained; or as mental constructs, ideas about and representations of space and its social significance. Edward Soja critically re-evaluates this dualism to create an alternative approach, one that comprehends both the material and mental dimensions of spatiality but also extends beyond them to new and different modes of spatial thinking. Thirdspace is composed as a sequence of intellectual and empirical journeys, beginning with a spatial biography of Henri Lefebvre and his adventurous conceptualization of social space as simultaneously perceived, conceived, and lived. 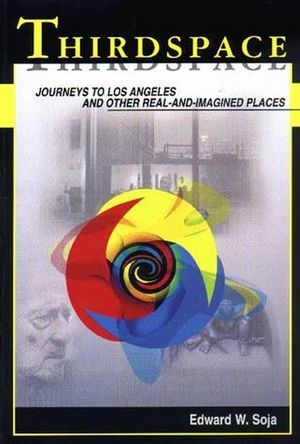 The author draws on Lefebvre to describe a trialectics of spatiality that threads though all subsequent journeys, reappearing in many new forms in bell hooks evocative exploration of the margins as a space of radical openness; in post-modern spatial feminist interpretations of the interplay of race, class, and gender; in the postcolonial critique and the new cultural politics of difference and identity; in Michel Foucault's heterotopologies and trialectics of space, knowledge, and power; and in interpretative tours of the Citadel of downtown Los Angeles, the Exopolis of Orange County, and the Centrum of Amsterdam. Born in the Bronx and nurtured in its dense diversities, Edward Soja was a street geographer by the time he was ten and a doctoral student in Geography at Syracuse University just after turning twenty-one. For the next two decades, he specialized in the political geography of moderization and nation-building in Africa, holding visiting appointments at the University of Ibadan, Nigeria, and at the University of Nairobi, Kenya. After seven years of teaching at Northwestern University, he joined the Graduate School of Architecture and Urban Planning, UCLA, in 1972. He has twice been department chair in Urban Planning and, for nine years, was the Associate Dean. For the past fifteen years, he has been writing about the postmodernization of Los Angeles, where he lives with his wife Maureen and children, Christopher and Erika. Part I: Discovering Thirdspace: . 1. The Extraordinary Voyages of Henri Lefebvre. 2. The Trialectics of Spatiality. 3. Exploring the Spaces that Difference Makes: Notes on the Margins. 4. Increasing the Openness of Thirdspace. 5. Heterotopologies: Foucault and the Geohistory of Otherness. 6. Re-Presenting the Spatial Critique of Historicism. Part II: Inside and Outside Los Angeles: . 7. Remembrances: A Heterotopology of the Citadel-LA. 8. Inside Exopolis: Everyday Life in the Postmodern World. 9. The Stimulus of a Little Confusion: A Contemporary Comparison of Amsterdam and Los Angeles. Presents a new transdisciplinary mode of thinking about space and the spatiality of social life.